This post is cross-posted on NextBillion.net. File this under the eye-catching-Bottom-of-the-Pyramid-design category and add it to the list of fascinating cycle innovations intended to meet multiple needs for the poor – in this case, the challenges of water filtration and transportation. 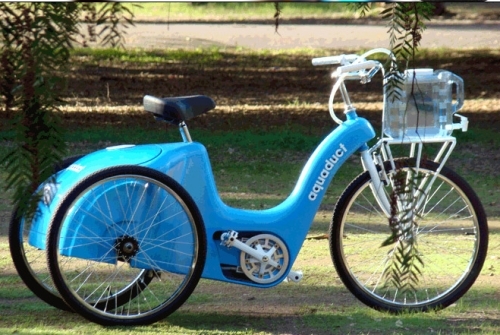 The product is called the Aquaduct, a tricycle designed by a team of five at IDEO that stores water in a twenty gallon tank in the back of the bike’s wide, blue frame. As the user travels back home, the energy they expend pedaling is used to filter the water into a removable two gallon tank that rests in front of the handlebars. As with any shiny new Bottom-of-the-Pyramid innovation, it’s important to remember that just because the product is inarguably cool doesn’t mean it will actually be applicable in the specific context of local consumers. Has research been done to confirm that the Aquaduct would be cost effective and functional for the BoP in different regions as compared to other available means of water filtration and transport? And I didn’t understand the idea of storing 20 gallons of water but having only two gallons filtered – is this really enough for a family? Does the user have to pedal around every time they want an additional two gallons of filtered water? These are questions that IDEO will have to answer as the bike moves beyond its prototype status (and I’m sure they will – if they haven’t already). In the meantime, IDEO’s creation has shown promise as grand prize winner of the Innovate or Die contest for sustainable cycle design. Maybe soon, we’ll see it in use on the ground.